Epiphone is proud to present the Epiphone ES-175 Premium, a faithful new reissue of what many consider the most famous electric archtop in popular music, heard on classics from jazz to rock in the hands of pioneers like Joe Pass, Scotty Moore, and Wes Montgomery. 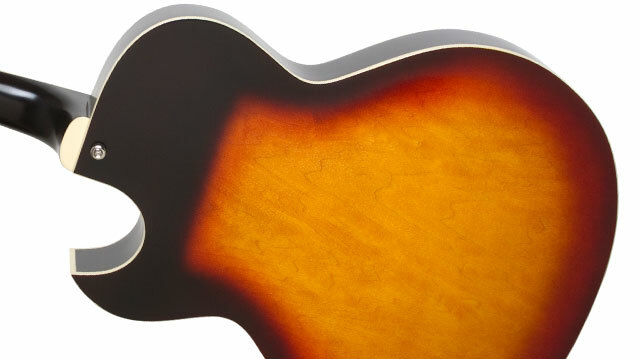 Epiphone’s long history of innovation began with designing archtop guitars. And now, Epiphone steps up its game again with the new ES-175 Premium featuring Gibson USA '57 Classic pickups and a vintage-inspired "aged" Lacquer finish that will make you think you're playing a 50's original but at a price anyone can afford. The ES-175 was introduced in 1949 as a mid-size, more affordable version of the venerable L-5, the very first modern archtop and the inspiration for the best Gibson and Epiphone archtops of the jazz era. The original ES-175 was truly a modern guitar that anticipated a new era of jazz and pop music that was hotter, louder, and constantly stretching musical boundaries. The ES-175 was the first archtop with a Florentine (sharp) cutaway. And by 1957, it came with the innovative and now standard humbucker pickup. The ES-175 quickly the preferred model for both jazz players and rock and rollers with a background in jazz, especially for guitarists looking for the “Wes Montgomery” L-5 sound at a lower cost. The new Epiphone ES-175 Premium is just like the original--a fully hollow jazz box that’s easy to hold, easy to play and affordable. And with the addition of Gibson ’57 Classic pickups, the Epiphone ES-175 Premium is versatile enough for any genre with cool crisp archtop tone from its all-maple construction and killer humbucker pickups. One thing you can’t get with a vintage instrument is Epiphone’s Limited Lifetime Warranty and Gibson 24/7/365 Customer Service. The Epiphone ES-175 Premium is more than just a time travel guitar. It could also be the only guitar you ever need to own. But maybe you should get two, just in case. Visit your favorite Authorized Epiphone Dealer and make your own history with the ES-175 Premium today. Today, Epiphone is the world’s most popular archtop brand, and the introduction of the ES-175 Premium brings Epiphone full circle in its long history of producing affordable, professional instruments that can deliver pro sound night after night. The new Epiphone ES-175 Premium features a traditional laminated Maple body with single ply binding with a vintage-inspired “aged” Lacquer finish topped off with a traditional 3-ply black and white pickguard. The ES-175 Premium comes in four beautiful colors, Ebony, Natural, Vintage Sunburst, and Wine Red. The ES-175 Premium has a hand-fitted, glued-in Mahogany neck with a SlimTaperTM profile and a 24.75” scale that’s poised to come alive with the very first note you play. The bound fingerboard has classic split-parallelogram inlays and Epiphone’s iconic “sloped dovewing” headstock is fitted with Grover® 18:1 machine heads for quick, accurate, and intuitive tuning, and a standard 1.68” nut. 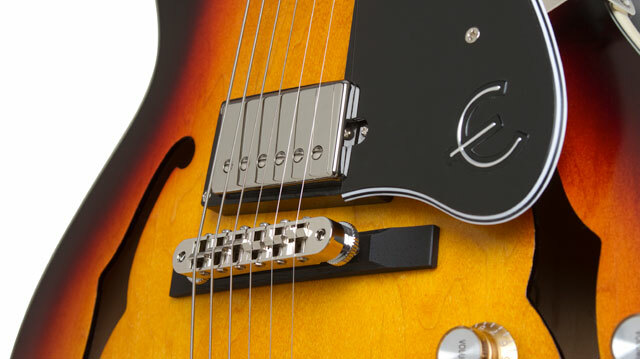 Every great electric archtop has great pickups and the ES-175 Premium truly becomes a time-traveling marvel with the inclusion of two Gibson USA ‘57 Classic humbucker pickups that recreate the wide tonal range and incredible sensitivity of the ES-175’s original PAF style pickups that today are the most sought after vintage pickups in the world. 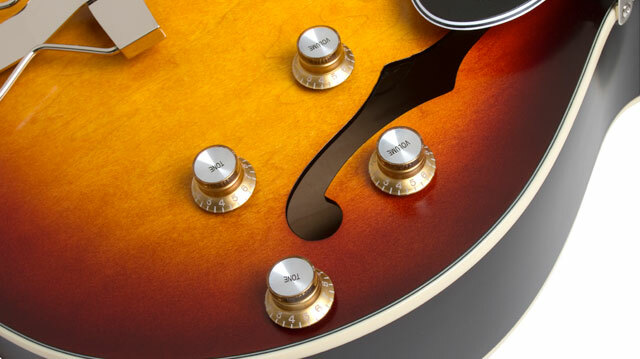 All Epiphone instruments feature rock solid hardware that’s guaranteed for life. The ES-175 Premium comes with Epiphone "Deluxe" machine heads and full range controls for volume and tone all equipped with Epiphone’s full-size 1” 500K Ω potentiometers, a rim-mounted output jack, and Epiphone’s 3-way all metal toggle mounted on a traditional rubber grommet. The bridge is set up with a traditional floating base supporting a fully adjustable nickel Tune-o-matic bridge. The bridge is "pinned" to ensure perfect placement and intonation every time. And the classic "Zig-Zag" Trapeze tailpiece makes the new ES-175 Premium virtually indistinguishable from a vintage original—except for the price! An optional premium hard case is also available.